ANZA, Calif. - Aug. 24, 2018 - PRLog -- At Marketplace Cooperative, Inc. we believe in the power of connecting with others — and we enjoy seeing the high country of Southern California through your camera lens. Visitors and residents alike enjoy the diverse scenery exemplified by varying elevations, senses and seasons. 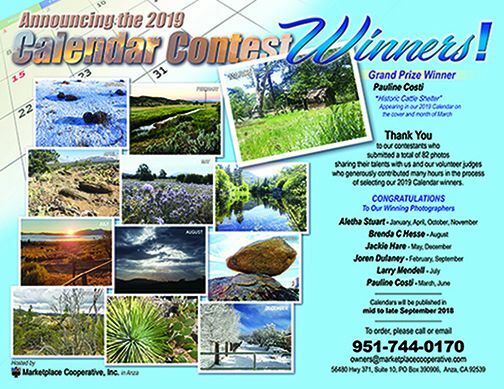 The theme of the limited edition 2019 calendar is "Landscapes of the High Country." We hope to highlight the splendor of living in the beautiful environment that residents of Anza, Aguanga, Mountain Center, Garner Valley, Pinyon and the other surrounding hamlets call home. It was a difficult task to narrow down the beautiful photographs we received — but we think you'll agree that our judges found great examples of our theme. A special thank-you goes to all of those who submitted photographs, and to our judges. The panel of judges selected 12 photographs to showcase in the inaugural calendar. The photo chosen for the cover is named "Historic Cattle Shelter" and was captured in Idyllwild, CA by Pauline Costi. It will be the featured cover and will appear again in the month of March. An additional 11 photos are highlighted for each remaining month of the year. Costi is joined in the winners circle with Alteha Stuart, Jackie Hare, JoRen Dulaney, Larry Mendell and Brenda Hess. The calendar is available for purchase through Marketplace Cooperative, Inc. and local merchants. Visit http://www.marketplacecooperative.com for a preview and retail or bulk ordering information.